I have a confession: I am a perfectionist. I know, I know. That has become a generic answer in job interviews all around the world. It isn’t exactly an uncommon trait when questions such as, “What is your greatest weakness?” arise. You know, turning your negative quirks into positive attributes and all that. But trust me, being a perfectionist can be crippling given the right setting. Take writing for example. I first signed up for a writing course my sophomore year of college. I chose it on a whim as an elective to fill up space. There I was sitting in the very first row. I had my special notepad out, quotes written on it to keep myself motivated. My pen was freshly filled with never before used ink. I was wearing a sunny disposition and a go get ‘em attitude not yet sequestered by workshops with my peers. I remember my professor’s one and only advice that semester: just write. I could not put it together. Just write… anything? I needed a plan, a prompt. I needed to stick to a guideline and follow the rules. Writing whatever came to mind was messy and unorganized. My thoughts were incoherent and I began rambling all over the place. I remember writing about writing. I remember writing about not having anything to write. I remember writing about how I could not wait to get home and make a peanut butter and jelly sandwich. But in between the frustration and the hunger, I began to come across an epiphany. Writing for the sake of writing un-jumbles your mind. Writing down your current thoughts removes them to make way for the deeper, more intimate and meaningful material. As soon as I got over my fear of being messy, I wrote anything and everything. Sometimes the material was useful and I was proud to hand it in. Other times my writing was awful, and I sheepishly handed it over without making eye contact. The difference in myself was that I learned that it was okay to write something bad, as long as I was writing. With this newfound euphoria for writing, peer workshops were my kryptonite. You see, another side to my perfectionism declares that once I deem something complete, it’s done forever. The end. Send it off to the publishing company. My thought process was that I had worked hard on my project and it had become my masterpiece. I wanted to protect it. I walked into the peer workshop with doe eyes, clutching my story to my chest like a child protecting their candy on Halloween. My heart was racing and I could not wait to share my art with my classmates. We sat in a circle, because it’s not enough to hear them tear apart your story, they also look you in the eyes when they’re destroying your hopes and dreams. Peer workshop was brutal. I could not comprehend why everyone was focusing on the things in my story that needed improvement instead of patting me on my back and giving me a “good job” sticker. But then it hit me; these kids were not my mother. These kids were not here to tell me how great my writing was. I was looking for affirmation in something that was complete; I was not looking to change it. That’s when another epiphany hit me; my story was not art. It was a rough draft, something that needed time and care, changes and revisions in order to become something better. I had to open myself up to criticism and more messiness in order to become something great. 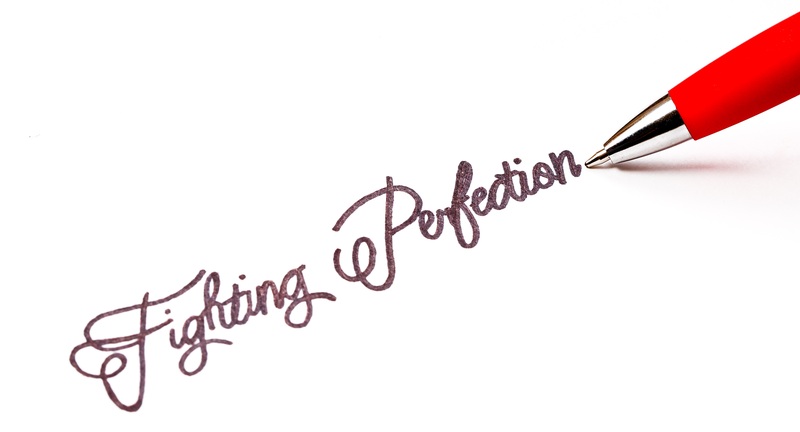 Striving to be perfect when writing was difficult. But once I got past that, I learned it was okay to be terrible. It was okay to crash and burn. It only makes you better. You are amazing Kaitlin; just perfectly amazing. Having a problem with perfectionism with writing is something I struggle with too, only I seem to have the opposite problem: instead of a story being done forever, I constantly think it needs to be better, needs to be improved. While I know it’s good that I’m willing to make changes, I tend to over-complicate the problem and start looking for errors in a piece that’s likely polished enough to send out. But I don’t and miss deadlines because it when it comes I don’t feel it’s polished enough. However, I am getting better at this as time goes on and be less fearful about submitting work when the deadlines arrive. Learning to overcome perfectionism in writing can be a challenge, and it looks like you’re finding good ways to overcome yours. Likewise, I fully agree that writing for the sake of writing unclutters your head. Writing is usually my fallback when I’m feeling stressed or overwhelmed and I almost always feel at least somewhat better afterwards. Your post really gets at the main issue that most writers have with writing: writing something bad in order to get to something good. I think that a lot of this comes from the relationship that we have with already written stories. They are lengthy, well-written, and compelling, so we get lost in appreciation of the beauty of the story without being able to see the invisible torment that the author probably went through to get the book into its final form. I have struggled with the issue you discuss many times…wanting to be perfect at writing and procrastinating or simply avoiding it because of this. Most of all, I think if I, you, or we want to be writers, we have to find ways of enjoying writing as a practice even if the end result isn’t always a brilliant and wholly original masterpiece. I really enjoyed this! I have a problem with considering my first drafts perfect. It’s good to know others feel the same way.